If you get a chance to check out The Scones before our gig, I highly recommend it. I cant wait to hear them play Ode To The Mountains from their Greasy EP! We’re delighted to support Gold Medal Famous launching their new album “Activity” at MOON in Newtown, Saturday 19 August 2017! The Doubtful Sounds have had our first release in China – the Botanic Garden indiepop fanzine. 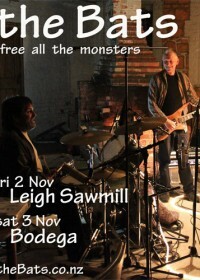 We are delighted – and blown away – to be supporting Flying Nun icons the Bats at Leigh Sawmill on Friday 2 November.